A report in the journal Nature says the world can only afford to extract a fraction of its known reserves of fossil fuels for any realistic chance of keeping global warming to within two degrees. 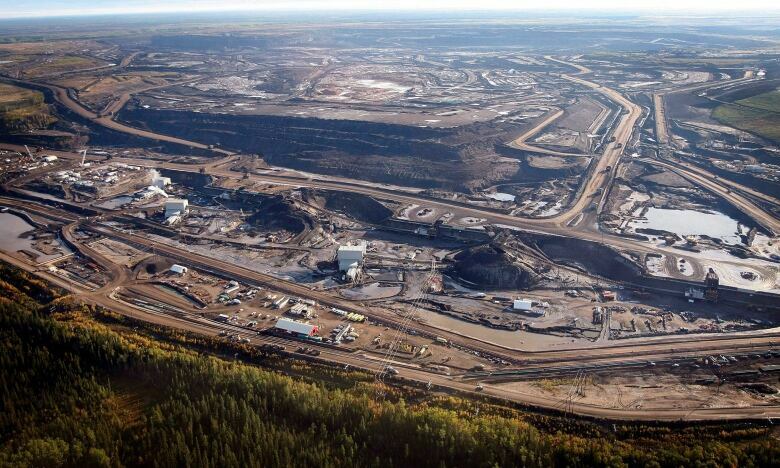 And that means much of Canada's oil resources must go untapped. Most of the Earth's fossil fuels will have to be left in the ground if the world is to avoid catastrophic global warming, according to a new study published in the scientific journal Nature. And Canada's oil patch would have to be left mostly unexploited if the world is to avoid a rise in average temperature of two degrees or more, as almost every country in the world has committed to do. "All politicians worldwide have signed up to this idea of keeping temperature rise below two degrees," said author Christopher McGlade. "One of the stark findings to come out of this study was how that is inconsistent with current views that every country wants to produce all of its own reserves and resources. So what we wanted to show was the disparity." McGlade and co-author Paul Elkins, both of University College London, calculated that the total amount of carbon stored in fossil fuel reserves that are known, technologically viable and likely to be extracted under current economic conditions is about three times what the planet's atmosphere could be expected to absorb without breaking through the two-degree barrier. The only way to avoid releasing that carbon into the atmosphere is to ensure that most of those reserves stay where they are: underground. Moreover, any unexploited oil and gas reserves in the Arctic should be considered unusable, if the target is to be maintained. Canada is one of several countries that have been eyeing those reserves as a possible ace in the hole. "The study indicates that all of that should remain unburnable if we want to stay within two degrees," McGlade told CBC News from London. The study, titled "The geographical distribution of fossil fuels unused when limiting global warming to 2 C," says there is no point in continuing to explore for new deposits of oil and gas anywhere in the world, since we cannot afford to extract what has already been discovered. A worldwide goal of a maximum two-degree rise over pre-industrial temperatures has been set by the International Panel on Climate Change, and 195 of the world's countries (including Canada) have signed on to that goal. This report shows countries need to make painful decisions and forgo some of the easy economic growth that can be achieved by exploiting fossil fuel reserves on their national territories. And it's not only heavy oil derived from bitumen that's implicated. The study says Canada would also have to leave some of its conventional oil and natural gas, and almost all of its coal, untouched. Other countries would be expected to leave large reserves of fossil fuels untapped, especially coal-producing countries such as the United States, China, India and Russia. "This report is another wake-up call to snap us out of our denial of climate change," says John Stone, a Canadian researcher and one of the lead authors of the latest report of the IPCC. Stone emphasizes that keeping warming to within two degrees does not mean the world avoids negative consequences. He says the target comes from a political decision on how much risk and damage the world is willing to tolerate as it transitions to a sustainable economy powered by renewable energy. He stresses the effects of climate change are being felt already, and will be much more severe with a mean two-degree rise. Already, mean global temperatures are about half a degree higher than they were before the Industrial Revolution, and carbon already in the atmosphere today would probably produce another half-degree rise even if all emissions stopped tomorrow. The consequences of a two-degree rise would be felt differently around the world. But recent studies on food production have shown that even a two-degree change would cause great harm to crop yields in places such as India and China, raising doubts about those countries' ability to feed their people in the future. Alarm about those studies among senior Communist Party officials in China may have been a factor in China's decision to sign a historic climate deal with the United States in November. Stone said the study shows the scale of the challenge. But he remains optimistic it can be done. "If you go back into history we modified our economy to fight the war, in amazing ways if you look back on it. So if you've got the optimism, you've got the imagination and more than anything if you've got the political will, anything is possible." Stone said the report is not saying the world will have to live without energy, only that it has to speed up the transition to alternatives. "As a Saudi oil minister said in the '70s, 'the Stone Age didn't end because we ran out of stones. It's because we changed the technology.' And we're now going to have to change our energy system from one that relies on fossil fuels to one that relies more and more on renewable energy."